sailboat. : Life via Instagram #6. This is the first weekend in a very long time that I have been able to enjoy and it has felt so good. I hope you're all having a wonderful weekend and that the less than spring-like weather hasn't put too much of a dampener on your plans! It's my birthday tomorrow which I'm super excited about, I don't have anything special planned, I'm just going to enjoy yummy birthday cake and celebrate turning twenty three! 1. The beautiful Dahlia dress I'm thinking of wearing for my birthday! 2. Super cute bunny in a top hat necklace from Cheap Frills. I have a lovely necklace from Cheap Frills that's perfect for spring & summer to giveaway this week that I'm really excited about! 3. The Collection 2000 Shimmer Shades blushalicious blush, which is a birthday gift from the ever so lovely Leanne! Thank you SO much you lovely lady, it was such a wonderful surprise! 4. The only way to keep Bailey quite is to give him a bone. He's the most determined little puppy, he won't stop chewing until it has successfully been destroyed! 5. Ralphie bunny has been his usual mischievous self. He's found a spot under my wardrobe that he can squeeze himself into and I can't reach him. He usually hops under there when I tell him it's bedtime. He doesn't like bed time! 6. Yesterday & today are pineapple hair days for me. I may look ridiculous but I don't care! 7. Hello face! I have been loving Revlon Raspberry Pie Lip Butter recently, this season is all about the bright lip for me! 8. My pink ombre. I used Directions Carnation Pink & I adore it. 9. Still in love with my London School of Sorcery jumper from The Orphans Arms. It's super comfy! I really love their Cezanne jumper too, I think it's the same/a similar cut to the one I already have! Have you been instagramming lately? My username on there is sailorjennie if you would like to have a looksee! Have you got any lovely plans for the bank holiday weekend? I hope you're all doing well! Yay birthdays! Have a lovely one. That little rabbit in the hat is so cute! 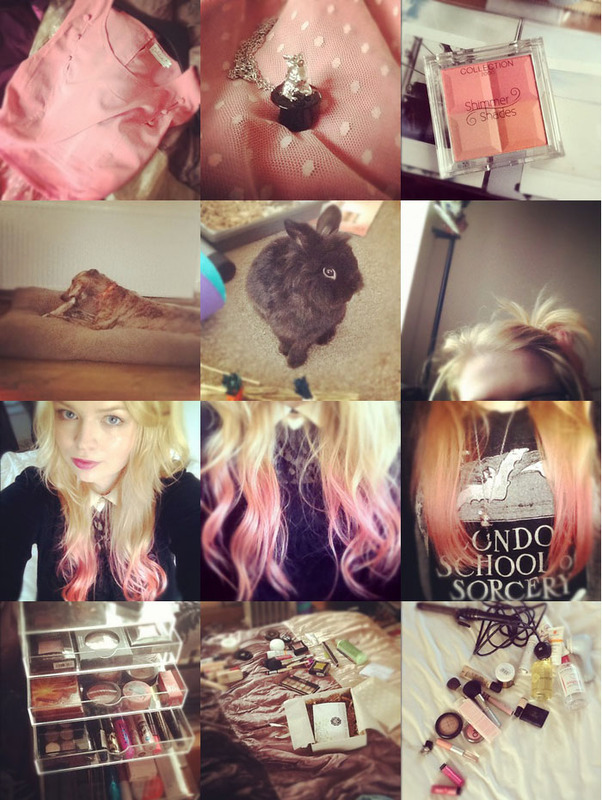 Just followed you on instagram, i'm belledubrighton. the shimmer shades looks awesome! i love the colors. i wish we had collection 2000 here in the states. i can't wait to travel overseas & shop some of y'all's wonderful beauty collections! Your hair looks beautiful dip dyed! Wow Jenny I am loving your hair! Your hair looks soo lovely with the pink! Not always a fan of the dip dye but looks gorgeous on you!